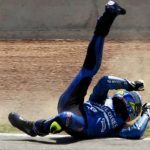 Wearing the right motorcycle clothing is essential not only for your comfort but also for protection from injury. However, the sheer amount of gear available out there is mind boggling and as a beginner rider we know that your budget is stretched. 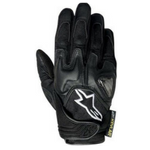 So we decided to create this page which is full of advice on what to look for in your motorcycle safety gear. We have also made three top recommendations in each category, this is kit that offers reasonable quality at an affordable price. Our suggestion is to always buy the best quality gear you can afford as this will give you the greatest level of protection. Seamless gloves or gloves with external seams will help prevent blisters and pressure points.Gauntlets will keep cold air from going up your sleeve. Long sleeves and trousers resist abrasion and protect against sunburn, windburn, dehydration, and hypothermia. Light colors or reflectivity increase a rider’s visibility. Good clothing will help you stay comfortable while riding in adverse conditions. In case of a crash or spill, high-quality riding clothes will help prevent or reduce injury. Leather clothing is often used by riders because it is durable and abrasion-resistant, giving good protection against injury. Many other synthetic fabrics have also been developed that are abrasion or wind resistant, waterproof, or have high visibility properties. Many motorcycle dealers carry a varied line of riding jackets and suits. They can be helpful in answering questions you may have regarding the beneficial properties of each. Personal riding habits, budget, and local weather conditions will influence your choice of purchase. Shop wisely, making sure your purchase is strong enough to resist abrasions. The clothes you wear when riding can serve to make you more visible in traffic. Choose brightly colored clothing when possible. 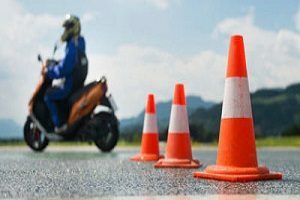 Only two riders of the 900 accident cases studied by researchers were wearing brightly colored clothing. If you wear dark clothing, inexpensive retroreflective vests can be worn over the jacket. Also, it is a good idea to affix reflectorized tape striping to garments you wear regularly when riding. This applies to bright clothing worn during the day. Unless they are reflectorized, they will not offer the same good visibility at night. Jackets made with retroreflective material also will help make you more visible at night. Your clothing should fit comfortably without binding. A jacket with a zippered front will be more wind-resistant than a jacket with buttons or snaps. A flap of material over the zipper of a jacket gives additional protection against the wind. Jackets with snug cuffs and waist are recommended to keep wind from blowing into the garment. Be careful about collar style – a large, loose collar will flap when riding and may irritate your skin or distract you. Remember that even in relatively warm weather, constant exposure to wind when riding may cause hypothermia: a subnormal body temperature. Hypothermia can cause you to lose your ability to concentrate and react to changing traffic conditions. Motorcyclists are especially susceptible to rapid chilling that leads to loss of reflexes, a symptom of hypothermia. The biggest danger of the subnormal body temperature found in hypothermia is the deterioration in the ability to think clearly. 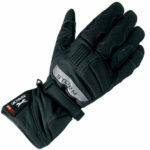 Proper riding gear, such as a windproof jacket and insulated layers of clothing, is essential. On a warm day (18 degrees Celsius), a motorcyclist riding at speeds of 45 to 55 miles per hour experiences a chilling effect equivalent to 1 degree. That is only one degree above freezing. Riders not dressed properly for the chill could become victims of hypothermia. Clothes that are just right for cold-weather riding may be too hot once you stop riding. To prevent this, dress in layers so that outer clothing may be removed as necessary. Regardless of temperature, a light jacket should always be worn. Stay away from jackets made of extremely thin material. These jackets will flap too easily in the wind. On hot, sunny days, it is best to wear lightly coloured clothes and helmet. Lighter colours reflect the sun rays, rather than absorbing them like darker colours. This can make a difference of 10 degrees or more on hot days. Wearing a jacket will reduce your chances of becoming dehydrated while riding on a hot day. Wind rushing over exposed skin quickens dehydration. A jacket helps protect your skin from drying wind. Armoured trousers are designed to keep you comfortable when riding and also to protect you in an accident. When it comes to protection leathers still offer the best all round performance and we highlight a surprisingly affordable pair below. Another decent lower cost alternative are motorcycle jeans which feature inbuilt kevlar lining and strategically placed armour. Want more on motorcycle jeans? Rainsuits are recommended in rainy weather. One-or two-piece rainsuits can be purchased in several materials, the most common being polyvinyl chloride (PVC) and nylon. 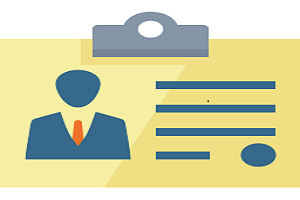 They come in different colours, but orange or yellow is best for high visibility. There are usually only small differences in rainsuit styles. The trousers of a typical rainsuit have elastic at the waist and stirrups (or tie-strings) on the legs to wrap around the rider’s boots. 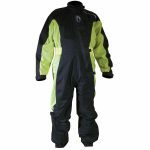 The rainsuit has a high collar that is held closed by a snap or adjustable hook-and-loop fastener. The front zips up and a wide flap fastens across the opening. The wrist openings fit snugly with more elastic. 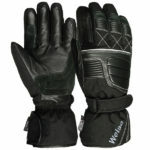 When purchasing a rainsuit, also consider purchasing glove and boot covers. 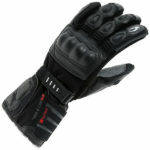 Most glove covers are large enough to fit over gauntlet-type gloves without interfering with hand flexibility. The boot covers should be worn under the rainsuit pants. The trouser stirrups are pulled over the boot covers. The boot covers will not take much abuse, so it’s suggested they be taken off before walking. 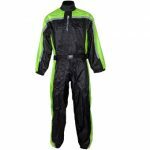 For the avid motorcycle rider, a rainsuit is a must. A dry rider will be much more comfortable and alert than the rider who is wet and cold. When preparing to ride in cold weather, several layers of clothing are necessary, usually starting with thermal underwear. Extra layers of trousers, shirts and jackets should be layered loosely to aid body heat in forming a warm insulation. Topping your clothing with a windproof outer layer will prevent the cold wind from reaching your body. Another alternative when riding in cold weather is to wear a snowmobile suit. These lightweight, insulated suits provide the warmth needed to prevent hypothermia. 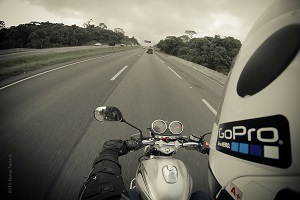 Another option available to motorcyclists is an electrically warmed suit or vest. These items hook up to the motorcycle battery and can be quite effective. Whether you ride in a warm or cold climate, in a rural area or the city, a good selection of high-quality riding gear will help you stay comfortable in all weather and riding conditions. And, if you have an accident or spill, it could save you from serious injury. 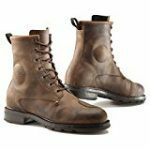 Over-the-ankle leather boots can protect riders from a variety of riding hazards. They protect ankles from stones that fly up from the roadway. They also prevent burns from hot exhaust pipes. In case of a crash or spill, boots help provide valuable protection against foot and ankle injuries. Boots with oil-resistant, rubber-based composite soles will give you a strong grip on the pavement and help you keep your feet on the pegs. Leather soles tend to be slippery and less durable. If the boots have heels, they should be low and wide. Any motorcyclist who has been hit in the face by a stone or an insect while riding can tell you about the benefits of face protection. Windshields and eyeglasses do not provide adequate face and eye protection. Wind, insects and pebbles may be blown behind a windshield. Eyeglasses with shatterproof lenses may protect the eyes, but most don’t seal out the wind which makes your eyes water. Reports have shown that motorcycle riders with shields covering their faces suffered a lot less facial injuries than those without. Helmets providing full-face coverage with strong chin pieces and energy-absorbing liners are especially effective in reducing face injuries. Any visor (or goggles) sold for motorcycle use must have been tested to BSI or its European equivalent standards. BS 4110 or ECE 22-05 are the standards and the visor should have this standard etched upon it or on a sticker attached to the visor. Visors must be able to transmit at least 50% light. Deeply tinted visors, which will not have a mark of approval, are illegal in this country (UK). It’s important to keep your visor or goggles clean using warm, soapy water and NOT solvents or petrol. If they become badly scratched renew them. By law, you must wear a safety helmet when riding a motorcycle on the road. It is the most important piece of protective gear a rider can wear. It protects against head injury, windblast, cold and flying objects. Full-face helmet recommended. Motorcycle helmets are either full-face or open-face. 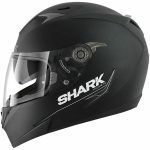 Full-face helmets cover the head fully and have a hinged visor. They protect the face in an accident and offer more weather protection than an open-face helmet. Open-face helmets are preferred by riders who feel closed in by full-face helmets and can be worn with either a visor or goggles. They don’t protect the chin in an accident. Your helmet should be a firm fit. The padding will soon bed down and this could make the helmet loose. A loose helmet is uncomfortable and could also come off in an accident. They are made in 3 basic materials – polycarbonate, glass fibre and Kevlar. Polycarbonate is lighter than glass fibre, must not be painted or have stickers affixed and must not be cleaned with solvents. Glass fibre is heavier, lasts longer and is easier to clean than polycarbonate. Kevlar is an extremely tough material which combines great strength with light weight but tends to be expensive. If your helmet receives any serious impact buy a new one. Damage won’t always be visible to the naked eye and a damaged helmet could be unreliable in an accident. We recommend you never buy a second-hand helmet. We highly recommend having your helmet fitted by a professional in a bike shop as the size and shape of each persons head is different. If you must buy online then we have highlighted some good value options below, all items can be returned for free if they don’t fit correctly. Want more on the best budget helmets?